To SNP or not to SNP?? I received an e-mail the other day from someone who had been asked to take a SNP test by their project administrator. What they asked me was, “Why would I want to do this and what’s in it for me?” Seems like a simple enough question, but not exactly. You can participate in science research. So here’s the longer but more accurate answer….and by the way…when you’re done reading this, you’ll understand why it matters, personally, to you. And you’ll probably want to order a SNP test or two. I’m going to use the haplogroup E project for an example. I’m a co-administrator of the project, along with two other individuals, one of which is a population geneticist. I am very, very grateful for Aaron’s interest in the project. As project administrators, we feel that it’s our responsibility to group people within the project in a way that is both helpful to them and to scientific research. Fortunately, these goals do not conflict and are one and the same. The haplogroup E1b1a, which is the core haplogroup of this project, as opposed to brother haplogroup E1b1b, is defined by a series of SNPs. Each letter and number after the initial E is defined by a SNP. So each additional letter or number makes the resulting haplogroup more specific. More specific means more granular in both geography and time when the haplogroup, and subgroups, were born. In the haplotree, there was a big split between E1b1a, which is Sub-Saharan African and E1b1b, which is North African/Mediterranean, known colloquially as the Berber haplogroup. Therefore, two separate projects make sense. The project is officially known as the E1b1a-M2 project. M2 is what is known at the “terminal SNP,” meaning the one furthest down the tree that defines E1b1a. On the haplotree above, you can see the lighter green M2+ SNP that was tested to confirm that this person was indeed in haplogroup E1b1a. The plus means that they have the SNP. If they didn’t have this SNP, then they would not be in this subgroup of haplogroup E1b1. The orange SNPs listed below the E1b1a branch, on the haplotree above, are all of the SNPs available to be tested to see if you are in those haplogroup subgroups. Want to know which branch is yours? If so, then now you know why you’d want to test. Let’s look at the project map to see why you might want to determine a subhaplogroup. The map below shows the entire E1b1a project with all of the participants. Do you see all of those people in the Americas? Well, those are participants who are people of African heritage who very much would like to see their balloon in the African continent, not on the shores of the Americas. The only way to determine where these people originated in Africa is to do the research that will connect the dots genetically, because we can’t do it via paper records, to where their ancestors lived in Africa. In order to do this, people need to take SNP tests for specific markers so that their results can be correlated with African groups. Tests for individual SNPs are only $29 each, so really quite inexpensive for the benefit you, and science, receive. Aaron, the haplogroup E1b1a geneticist, has divided the participants into groups, and using his expertise, has determined which individual SNPs are the most beneficial. A Deep Clade test is $139, but generally, Aaron can tell which subgroup people are likely to fall into, so he requests just a SNP or two. You can test a lot of individual SNPS for $139. Additionally, sometimes Family Tree DNA makes SNPs available for research testing that are not on the price list yet, and the only way to get these tested is via what is called “boutique testing,” where you order one at a time, through the haplogroup administrator. When Aaron sees someone who would benefit from this kind of test, he e-mails the person and asks them if they will take the specific SNP test. We have a very, very interesting situation where we have a man whose ancestral line is confirmed to be from Austria. This is highly unusual, as E1b1a is very clearly African and is seldom to never found in Europe ancestrally. However, this genealogy is well documented. You can see on the above map that Aaron has grouped a number of people together whose DNA has similar characteristics, meaning groups and values of markers. He wants all of these people to take specific SNP tests, which you can see on the drop down box as the title of the group. This is standard practice for haplogroup project administrators. On the map, you can see where these participants’ oldest ancestors are found. One in Austria, one in Africa and the rest in the Americas who are brick walled. 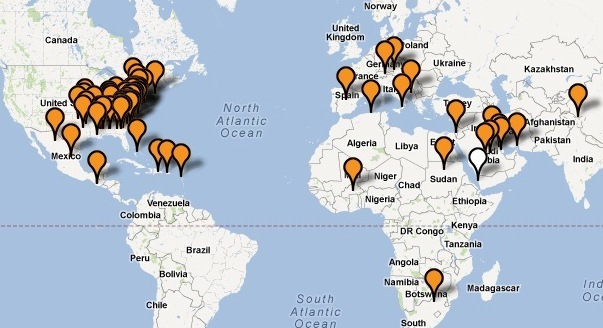 This map shows project participants. In order to look at where the research papers place these people ancestrally using genetic information, we need to use a different tool. We don’t know the African location origins of this particular group of people, which is why these SNP tests are so critically important. We need to match them in research data bases with other people who have these same SNPs. Let’s look at the haplogroup origins of someone within a different subgroup of E1b1a who is also brickwalled in the US. Shown below is the Haplgroup Origins chart from their personal page, showing their matches. You can see that several haplogroup matches, progressively more detailed (E1b1a to E1b1a7 to E1b1a7a3), have origins in Africa. The more detailed your SNP test, the more detailed your haplogroup, the more detailed and specific your location can and will be, if not today, then eventually. You can see above that this person, who has only tested to the E1b1a level, matches an E1b1a7a3 individual who is from the Bakola Pygmy tribe in Cameroon. If this person were to take the SNP tests, they would know if they too are haplogroup E1b1a7a3. If so, there is a very good possibility they too are a descendant of the Bakola Pygmy tribe in Cameroon. This is extremely powerful information for someone searching for their roots – the Holy Grail of genetic genealogy. But they will never know if they don’t SNP test, either by individual SNPs ($29 or $39 each) or the Geno 2.0 test ($199). If you’re lucky, the research on your particular SNP location in Africa has already been done. But you’re never too late to this party, because as new SNPs are discovered, there are always new opportunities to test. That’s the ying and the yang of pushing the frontiers of science. We are REALLY fortunate, because we live in a time where we can be participants in scientific discovery that not only helps us find your our own ancestors, but helps many others who are brick walled with no other hope of finding their ancestral homeland. This doesn’t just apply to the African haplogroups, but to all haplogroups. This is exactly how the revolutionary discoveries of the past few months and years that led to the new Geno 2.0 test came about. One person and one SNP test at a time. Want to find your ancestors AND make science happen??? SNP test! This is a companion article to Where is my Haplogroup From? This entry was posted in Haplogroups, Projects, Research, SNP (Single Nucleotide Polymorphism) and tagged Intermediate DNA by Roberta Estes. Bookmark the permalink. Great article, Roberta. This is a very clear and concise way to explain SNP testing to our participants. I plan to use this for my DNA projects!! There is a further function which is rarely used I admit but it is to discriminate between two signatures which are very close according to STR values. These two haplotypes could be related. Distinguising between them could be important for an adoptee seraching for a surname or for a researcher interested into the phylogeny of surnames (how surnames are related and differenciate from each others). Having at hand the SNP results for both signatures from a recent subclade test could still eliminate their recent relatedness. For instance one could be R-L2 and the other R-L21. The same applies to mtDNA testing when only HVR1+HVR2 variations are known. 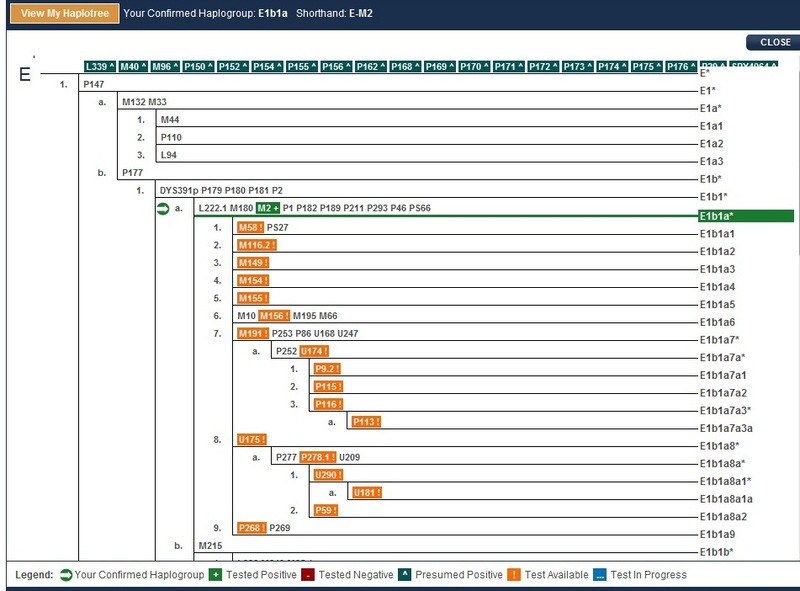 Proper classification (by the testing company) often requires using probes in the CR region to detect the presence of precice variations corresponding to those in the classification (PhyloTree.org). Bravo et merci pour votre blogue. Great stuff Roberta! Thanks for sharing your knowledge. Another very good reason to SNP Test and “Pay It Forward” for the Y-DNA Community and Science is to help another group of individuals with a newly discovered Y-DNA SNP to get “their” SNP on the ISOGG Tree. As an example, I am a R1b-L371. This is a Terminal SNP below R1b-L21. I don’t need to spend funds for more SNPs at this point. However, the ISOGG R Tree Admin recently asked me to SNP test for R1b-L643 in the process to get L643 Officially on the ISOGG R1b Tree. I graciously volunteered and ordered the $29 L643 SNP test at FTDNA and am almost 100% certain my results will come back as L643-. But, I have helped someone else and that counts in our Y-DNA Community. I just wanted to say how much I appreciate your DNAeXplained Blogs. They are excellent, very easy to read, and I refer to them often. Thanks for all you do! Overall, a good article explaining Y-DNA SNP testing. But I do have one small nit to pick. While M2 was the branch-defining SNP for E1b1a in the 2008 YCC haplotree, it had subclades underneath it. Therefore, by definition, it wasn’t a terminal SNP, i.e. the end of the line, with no further SNPs downstream. A terminal SNP has no subclades. It depends on how you are using the term. For example, at Family Tree DNA on the matches page for the Y, one of the columns is labeled “Terminal SNP.” That means the lowest level that this person tested positive for. What it doesn’t tell us, of course, if whether or not they have tested for any SNPs below that. So exactly what terminal SNP is referring to depends on the context in which it is used. I am glad that I just ordered Z18 snp test, because I did test positive as expected. My markers do not fit the current clusters under Z18 snp, so I am now part of an experimental cluster. I have contacted (8) potential candidates; per instruction from project director, that will most likely test positive for Z18 snp and be part of this new cluster. I have also ordered Z14 snp testing. I am an adoptee, and I am excited that I am closing in on my real haplogroup. I encourage others to look into this, and project directors can look at a person’s markers and determine whether they are a candidate. Your haplogroup is your deep ancestry. That ancestor could have migrated from Africa thousands of years ago. There are many other men in the same situation here in the states and that integration happened after 1607 – between then and now and they visually look white. Thanks to your article I believe I have a better understanding of the new naming convention. However, after studying the Haplotree I am a bit confused. For Haplogroup R1b1a2a1a1b4, the terminal SNP is R-M269. Could you explain why the terminal SNP would not be R-L21 instead? Also, how likely would it be for an African American in the above Haplogroup to NOT have any matches in Africa? 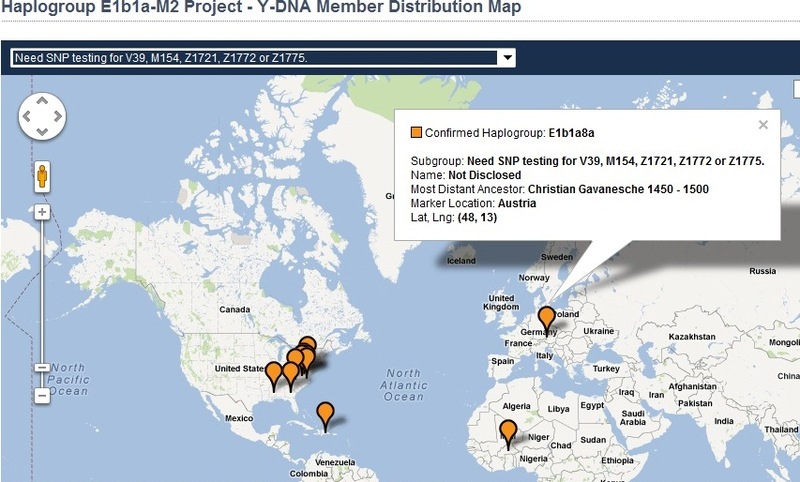 The terminal SNP for haplogroup R1b1a2 is M269. All haplogroups downstream of R1b1a2 has a different terminal SNP and a different name. The terminal SNP for haplogroup Reb1a2a1a1b4 is L21. Haplogroup R1b1a2 and all downstream haplogroups, like L21, is European, not African. If the person who carries this haplogroup is African American, this means that their paternal line is of European origin, not African. Thanks Roberta but I still don’t quite understand why R1b1a2a1a1b4 was assigned R-M269 as the terminal SNP instead of L21 (a1a1b4) which is downstream from M269. I’m new at this hi-tech science and just trying to understand. As for the paternal line, how far back are you referring to for the European origin? Wouldn’t the more recent paternal line which is definitely African American show up somewhere in the dna results? Thanks Roberta. I’ll check with FT. Sadly this info about deep clade testing is now like most things on the internet over a year old. Its out of date. i went to do this and the tests are now $39.00 each, and I do not see an option to deep clade test anymore. I did 2 at $39.00 its just way to expensive to do 20 plus other tests at that price. You are right, this is now out of date and I apologize. People are taking the Geno 2.0 instead of the individual tests. That test is $199 and tests over 12,000 SNPs. Then they follow up with any new SNPs discovered since that test was introduced a year ago. I am interested in taking some of these tests but I also don’t want to go on a wild goose chase and waste money. I tested as E-M2 with Family Tree in 2013 with their “backbone test.” How do I know which SNPs to test? Is it randomly picking from a list under my current haplogroup or do I not need to test any further than I already have? It depends on your goals. If you are happy with knowing what you know, then you are fine. Some people want to know as much as possible, and if you are one of these people, then the Big Y is the way to go because it reads all of the readable area of your Y chromosome and gives you a list of all the known SNPs and then all the personal ones or ones previously unknown. It helps you to some extent, and science too. I would suggest that you work with your haplogroup administrator to further define your needs and the best route for you. This was a great article and certainly clarified many questions I have. I REALLY appreciate how you reasoned the importance of SNPPING. My initial predicted haplogroup was E-M2. Having tested with Geno 2.0, it was E-U186; however, when I transferred my data into FTDNA, it is now E-U174. I assume the latter is my terminal snp? And does E-U186 define E-U174? What African region and/or ethnic group does E-U174 occur most frequently? BTW, Aaron has been excellent about answering my questions and providing sound guidance as to next steps to take in order to help advance this project and research. My goal is to pinpoint my Y-DNA origins as close as possible. Thank you, again! P.S. Help me out here ! The SNP test matches will be further back in time, generally, so more about your deep ancestry and less about genealogy. If you take the Big Y, you’ll be able to have SNP matches. If you just take the individual SNP tests, they will tell you which SNPs you match and don’t. This is a way to discover your ancient history. In reply to bin kaled who posted on April 21, 2013. Please I have my DNA tested but I don’t understand a single word of all this stuff. I humble ask if you can indicate some books or articles I can read FROM THE VERY BEGGINING, as if I have 5 years old. I thank you in advance. Thank you very much. I just downloaded it from Amazon. Starting to read. Tkx again. I am new to DNA testing and I’ve been frustrated both by not understanding what I’m looking at and by not being able to decide what I should test for next. This is the article that I needed for so many reasons and I thank you for it!